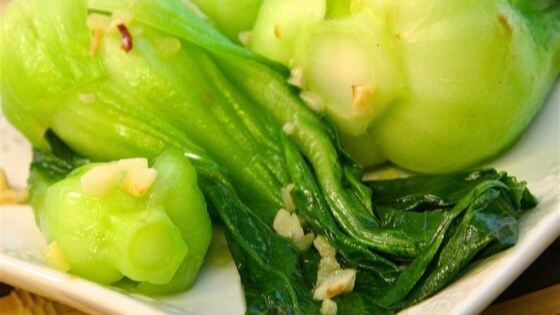 "This quick and easy recipe for bok choy stir fry goes nicely with any meat. I like to add 1/4 teaspoon chicken soup base (such as Penzey's®) to the hot bok choy. You can substitute 1/4 teaspoon ground ginger for the fresh ginger, if desired." Heat olive oil in a large skillet over high heat. Cook and stir garlic and ginger in hot oil until fragrant, about 30 seconds. Stir bok choy into garlic mixture, add water, cover the skillet, and cook until bok choy wilts and is desired texture, about 2 minutes. Quick and easy. I substituted chicken stock for the water, added a little sesame oil in addition to the olive oil and a whole lot of red pepper flakes. Delicious! I added cayenne pepper, veggie stock, and sesame oil for a delicious vegan entree! Excellent and easy to fix!